BioLite's first product was a neat little wood burning camp stove that harvested energy from its fire to a) burn more efficiently and b) supply some off-grid power for recharging your gadgets. Its main shortcoming was that it wasn't a great power source, providing only a tiny trickle of electricity that charged your stuff too slowly to be much use. When we reviewed it, we suggested that a traditional gas- or alcohol-burning camp stove, plus a portable power source like a Mophie Juice Pack, made more sense. Such an arrangement would be superior both for cooking and charging, while also being in total more portable. Well, here's that portable battery, combined with a lantern, an area light and a flashlight. At the heart of the NanoGrid is a 4,400 mAh lithium-ion battery with a USB output. Around that is wrapped a 200 Lumen LED lantern that projects its light up from the bottom, using translucent panels to catch and reflect that light outwards. It appears as if the entire body of the device is radiating light, but really, it's mostly battery pack. On the bottom are two LEDs housed in individual reflectors that serve as a 250 Lumen flashlight. The main body of the Nanogrid can stand freely or hang from the swiveling metal hook attached to it. That hook (pictured) is designed to attach easily to the closed fabric loops in the roof of tents. Then, there's two "SiteLights" included, which string out from the unit on 10-foot cords (for a total reach of 20 feet), and each project 150 Lumens. The main NanoGrid "Powerlight" body weighs 210 grams while the SiteLights are 52 grams a piece. All the light outputs are variable from little but a low glow all the way up to their max outputs. 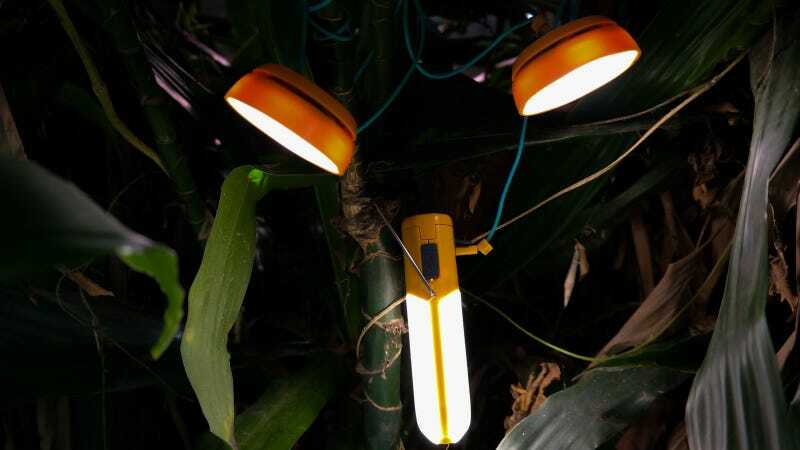 The Powerlight can provide light from both or a single side. Helpfully, BioLite lists light run times after the battery pack has provided one full charge for an iPhone 5 or equivalent smartphone. That real world "range" results in 36 hours of run time for the lantern on low or 4.25 hours on high; the PowerLight and two SightLights can run for up to 14.5 hours on low or 2.5 on high; and the whole shebang plus an additional two Sightlights can run for up to 12 hours on low, again after a full phone charge. In short, there's more than enough battery to get you through a full weekend spent outdoors. This thing is just handy. The PowerLight fits easily in the palm of your hand, yet can illuminate a campsite or serve as all the flashlight you'll ever need. The lantern radiates its light evenly and warmly, in contrast to most LED equivalents. Thank the light's textured reflectors for that. There are no spots or rings in the light it puts out at all which, in combination with the versatile hanging hook and the ability to switch it to produce light on only one side also makes it an ideal work light, perfect for looking under a car's hood at night. The two-LED flashlight is far from the nicest, the most powerful or the smallest you'll ever use, but it adds a welcome degree of extra usefulness. It switches on and varies power intuitively while providing plenty of light for any normal flashlight duties. At 250 Lumens it's much brighter than you'll be used to from, say, a large, incandescent MagLite, but you won't be spotlighting perps from a helicopter with it. The SiteLights are a clever addition, much aiding the NanoGrid's ability to provide campsite illumination. You can string the lantern up so it hangs high up above, providing overall light for your site, then position the SiteLights lower down over specific areas like, say, your stove or card game. Or, just spread the whole thing out to illuminate the widest possible area. The two SiteLights are magnetized and clip together into sort of a sphere for easy, safe storage. Their integrated cords wrap securely around the circumference of each and slide through a slot to set their length for easy hanging. Adding two additional SiteLights is an extra $30 and each nets you an additional 10-foot reach for a potential total of 40 feet. That'd allow you to wrap an entire campsite with them. The lantern's light is warm and free of hot spots or artifacts thanks to its reflector-based design. It may look like most of the PowerLight's volume is occupied by a lantern, but in actual fact that's mostly battery; light shines up from the base and is evenly radiated by the textured white reflector. My only real issue in the entire package is that the 2.5mm jacks that connect the SiteLights to each other and to the PowerLight don't connect with much retention. You have to apply some care to how you hang them so their weight is taken by the cord wrapped around something—as any tension on the line into the jack will pull it free. Recharging a phone or other device is handled as quickly and easily as by any other portable battery pack. Know your phone's battery capacity; an iPhone 5's is 1,440 mAh for instance, while my Moto X (2014) is a larger 2,300 mAh. I wouldn't get three full charges from the NanoGrid, but my typical two- to three-day camping trip involves one full charge from an external battery pack, so the BioLite is more than capable of providing both that and illumination throughout the one or two nights with charge to spare. BioLite doesn't list any level of waterproofness, so let's assume you shouldn't get any of this wet. The NanoGrid isn't going to fulfill everyone's portable power or lighting needs. Going off-grid for more than three days will typically require more battery capacity if you're a heavy user of cameras and phones and whatnot. There are lighter and more powerful flashlights available. But, the NanoGrid does represent both substantial value and an incredible level of usefulness for most casual campers, backpackers and outdoorsmen. The closest portably battery pack from Mophie, for instance, costs $80 and carries 4,000 mAh while a quality 250 Lumen flashlight would typically retail for $50 or more. Giving you both, in addition to the lantern, work light and SiteLights for just $100 is a good deal. Perhaps the NanoGrid's greatest strength is its multi-purpose design. The key to simplifying and lightening your load for any outdoor activity is to require that any item you pack solve multiple problems. And, with the NanoGrid, BioLite is solving all your outdoor lighting needs with the additional ability to charge your gadgets, all in a friendly package roughly the same size and weight as a portable battery pack alone. That's a big win in my book.